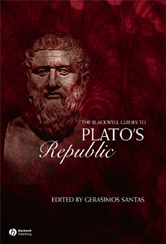 The Blackwell Guide to Plato's Republic consists of thirteen new essays written by both established scholars and younger researchers with the specific aim of helping readers to understand Plato's masterwork. This guide to Plato's Republic is designed to help readers understand this foundational work of the Western canon. Sheds new light on many central features and themes of the Republic. Covers the literary and philosophical style of the Republic; Plato's theories of justice and knowledge; his educational theories; and his treatment of the divine. Will be of interest to readers who are new to the Republic, and those who already have some familiarity with the book.